Editor’s Note: I have just been informed this evening, Monday, September 19, 2011, that Jan LeBaron passed away this morning due to complications encountered during surgery. My sincere condolences to her family and to all those that were inspired by this remarkable woman. When I know more details of this tragic event I will post them here. 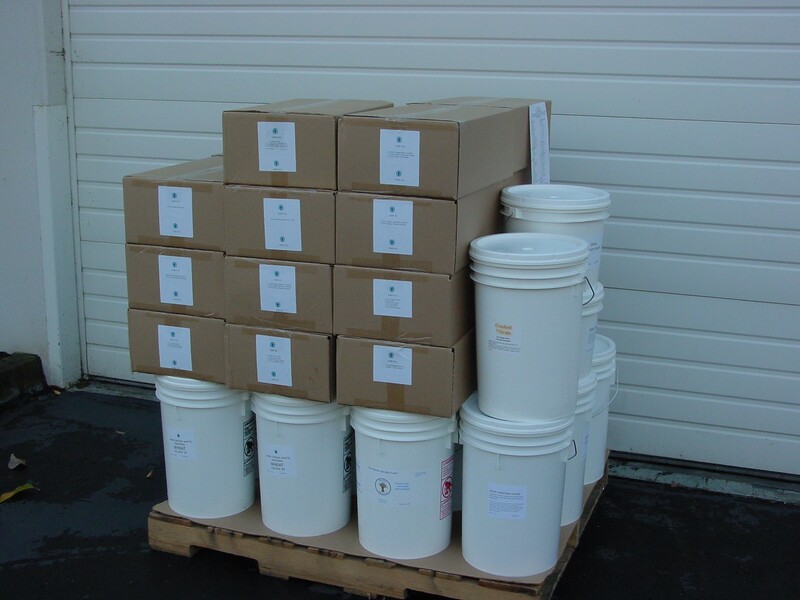 Throughout our community there is a growing interest in preparing for prolonged emergencies, and in particular storing foods for the long-term. Steve Bailey, the Director of the Pierce County Department of Emergency Management recommends that residents be able to survive in place for at least seven days where ever that is, including work, home, and in their car. Many go further than just a week, such as a month or two, or even a year or two, and those issues pepper unending discussions at the Self-Reliant Community meetings in both Graham and Eatonville. Stepping into these matters is Jan LeBaron, owner of the Healthy Harvest food storage and emergency preparedness supply center. “I come from a family that always put things up for the winter, and it’s just grown from there,” Ms. LeBaron told the Mountain News recently. What has sprung forth is Healthy Harvest, a retail and on-line supplier of bulk foods packed in buckets and other food stuffs suitable for short and long-term storage. In addition she also offers survival gear, such as low-emission fuels for lanterns and stoves. Such ease under pressure again stems from Jan’s childhood. When Jan moved away and settled with her children in Vancouver, Washington, her preparedness aesthetic came with her, first helping her young family become established – and then once she realized she needed a job – her fundamental skills became the seed that spouted into a business. Twenty-four years later, Healthy Harvest is a robust operation with a 4,000 square–foot warehouse and a large clientele. Jan provides plenty of private consultations to her customers and also holds group workshops several times each month. She also invites many experts to speak at her classes, which are held in her Vancouver warehouse. Ever the educator, Jan has written a unique cook book, one that is filled with 430 recipes on how to prepare delicious meals with only stored emergency supplies, such as dehydrated foodstuffs. 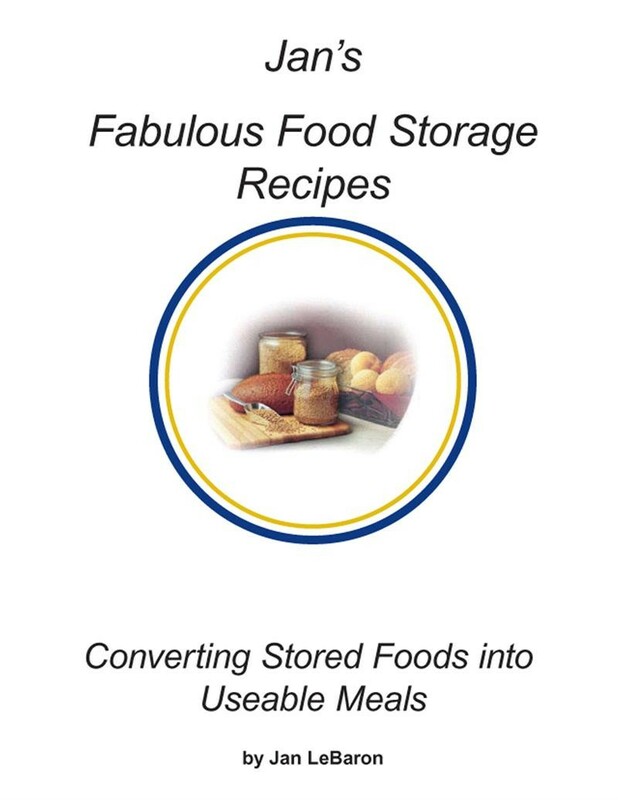 Titled, Jan’s Fabulous Food Storage Recipes – Converting Stored Foods into Useable Meals, it specializes in finding the right blends to make notoriously distasteful chow yummy, such as powdered eggs, powdered milk and other dehydrated products. 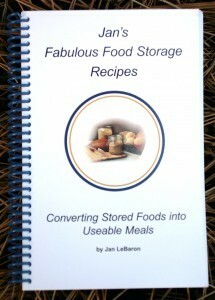 Jan's cook book, filled with hundreds of recipes that deliver wondrous meals based on stored foods. Besides being informative and original, the book rides a wellspring of Jan’s deeply held beliefs and many are calling it as the “missing link” in emergency preparedness. Besides finding the magic formula for powdered milk and eggs, Jan says the Big Secret of survival cooking is having enough spices. Jan also recommends stockpiling matches, surprisingly, but they are one of the items historians say were most lacking in the post-Civil War recovery in the United States a hundred and fifty years ago. “You’d be amazed how many people are storing food, nowadays,” she continued. As a result, Jan serves many people concerned about a wide range of disasters, folks she calls “preppers,” but she makes no personal judgments. In addition, Jan sees the fragility of modern living. “My generation has made a huge move towards a complete dependency on grocery stores,” she bemoans, citing the problems of “just in time” deliveries and the resulting need for affordable, and available, petroleum products. “People get desperate in three days,” Jan said, as she touted reports from her truck drivers on how interdependent and brittle the transportation system really is. “Even with a 4,000 square-foot warehouse filled with food, in a real emergency we’d be cleaned-out in less than a day,” she surmised. In the meantime, Healthy Harvest is off-the grid, utilizing solar power. “We practice what we preach!” she exclaimed. Further, Jan advises that folks “do not bank on one source” of supplemental energy. Jan has supplied her workplace and home with solar-powered flashlights and radios, along with candles and lanterns, the latter fueled with clean-burning “liquid paraffin,” which will not sting the eyes in the way kerosene does. In addition, she advises that folks stockpiling food have a butane stove for cooking indoors, a propane barbeque for outdoor broiling, and also a Dutch oven or two for baking bread in a fireplace or cooking vegetable stews in an outdoor campfire. As for the preppers, in her mostly on-line business Jan has found them everywhere. Jan also advices using “The Rule of Three,” which means having three different sources for vital supplies, such as water, generally regarding by experts as the single most important item to stockpile for emergency survival. Besides relying on city water or a well, Jan recommends storing water in 55-gallon drums and also placing water in smaller containers, such as two-gallon jugs. “You need two gallons per person, for two weeks,” Jan said. She also recommends possessing a reliable water purifier, and identifying a near-by lake, river or stream. “Don’t put all your eggs in one basket,” she advises. For more information, call Healthy Harvest at (888)-311-8940, or www.healthyharvest.com, or click on her ad in the right-hand column of this page. Lastly, Jan is in the early stages of planning a trip to Graham or Eatonville to speak at a gathering of those self-reliant communities, possibly as early as September. The Healthy Harvest – In our 24th Year! This entry was posted in Culture, Eatonville News, Environment, Graham News, Nature, People Profiles, Recipes, Self Reliance. Bookmark the permalink. Good work Bruce! Great article. Thanks. Jan is a remarkable woman, and I am eager to hear her speak at the Graham SRC. I’m awfully sorry to hear about Jan, we will miss her. Not to sound insensitive, but does anyone know if the business is still in operation? I have tried in vain to reach the business (it’s now November) but all I get is the message machine. If anyone knows the status, could you please make a post. I hate to order out of state for goods after I’ve dealt with Jan for 20 years. My condolances to her Family…. I as well have tried to reach the store… I really liked Jan and am also In Wa. and bought from her because she was local.. Can someone tell me if it will continue or who is the one to contact now? I tried contacting the family and the business about a month ago and have not heard anything back. I do not know the status of their business, but in the meantime, pending clarification, folks needing storageable foods and emergency supplies can contact the Survivial Center in Yelm, WA. I have recently made a purchase from Healthy Harvest, they are having a going out of business sale and have marked down the products between 40-45%. Its a great value and I highly recommend you checkout their website at http://www.healthyharvest.com while their supplies last. 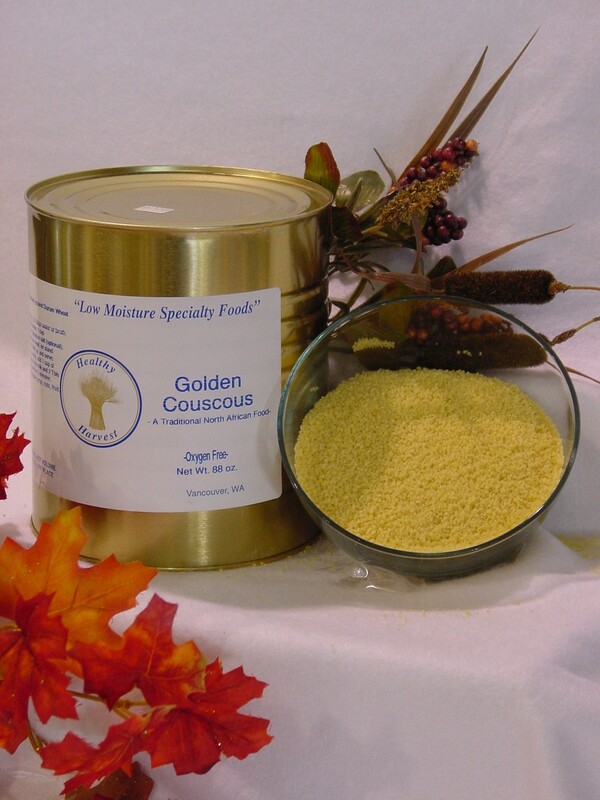 Jan’s son is handling the sale and is very knowledgeable on the products.